Transmission electron micrograph depict Nipah virus virions that had been isolated from a patient's cerebrospinal fluid. 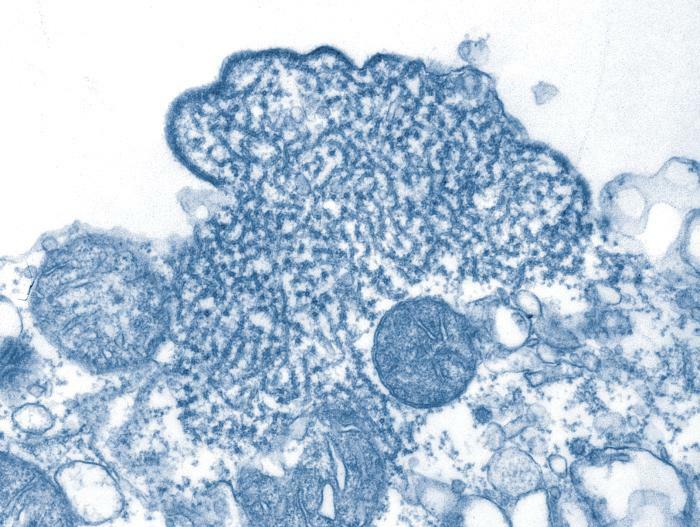 Transmission electron micrograph depict Nipah virus virions that had been isolated from a patient’s cerebrospinal fluid. An interdisciplinary research team from the University of Texas Medical Branch at Galveston, the Uniformed Services University of the Health Sciences (USU) and three groups within the National Institutes of Health reports a new breakthrough in countering the deadly Nipah virus. The human monoclonal antibody known as m102.4 is the first effective antiviral treatment for Nipah that has the potential for human therapeutic applications. Nipah and the closely related Hendra virus are highly infectious agents that emerged from Pteropid fruit bats in the 1990s, causing serious disease outbreaks in a variety of domestic animals and humans in Australia, Malaysia, Singapore, Bangladesh and India. Recent Nipah outbreaks have resulted in acute respiratory distress syndrome and encephalitis, person-to-person transmission and greater than 90 percent fatality rates among people. These properties make both Nipah and Hendra viruses a concern to human and livestock health. Previous studies conducted by these researchers have found that the patented m102.4 antibody therapy could protect nonhuman primates from a deadly Hendra infection. In a paper appearing in Science Translational Medicine on June 25, the group describes the human monoclonal antibody therapy that protected nonhuman primates from disease at several time points after Nipah exposure, including the onset of clinical illness in this lethal disease. Read at Science Translational Medicine: Therapeutic Treatment of Nipah Virus Infection in Nonhuman Primates with a Neutralizing Human Monoclonal Antibody.